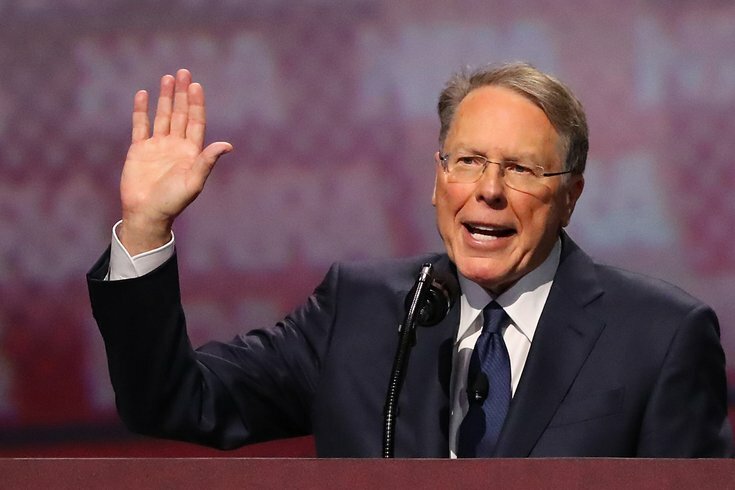 NRA CEO Wayne LaPierre speaks at the NRA-ILA Leadership Forum on April 28, 2017, in Atlanta. The National Rifle Association doled out more than $7 million in grants to hundreds of school districts across the country in recent years, including two dozen in Pennsylvania, according to an Associated Press analysis of tax records. Pennsylvania schools received more than $237,000 in NRA grants between 2010 and 2016 for programs such as the Junior Reserve Officer Training Corps and rifle teams, according to the report. Bensalem School District was the lone Philadelphia-area district named in the analysis, according to the Allentown Morning Call. The newspaper reported that Bensalem High School received more than $5,700 in cash and equipment from the NRA for its JROTC program in 2013. Superintendent Samuel Lee, who joined the school district in 2015, did not immediately return a request for comment on the donation. Several school districts in Berks, Lehigh and Northampton counties also accepted NRA donations, according to the Morning Call. The 25 Pennsylvania schools which received NRA grants is a small fraction of the state's 500 school districts. Outside of schools, more than 120 groups received a total of $24.4 million from the grants. Recipients included 4-H groups, Boy Scout troops, private gun clubs and local chapters of the NRA's Youth Hunter Education Challenge program, according to the report. The news organization also reported that the school district that oversees Marjory Stoneman Douglas High School in Parkland, Florida is believed to be the first school district to stop accepting NRA money after alleged gunman Nikolas Cruz gunned down 14 students and three adults there last month. Cruz, who has been charged in the shooting, had been on a school rifle team that received NRA funding, according to the report. AP's full report can be found here.